So, I know it has been well over 2 months since I have posted ANYTHING on this blog, and I apologize for that and will try to post more often. That being said, I have seen a ton of movies over the last few weeks but would like to highlight two. First up is Dan In Real Life. Dan In Real Life is hard to describe. It's plays like an indie flick, but packs the star power of a blockbuster comedy. 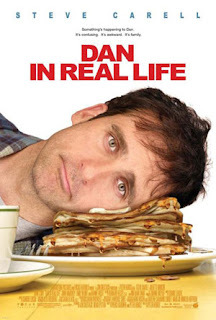 Dan In Real Life follows the story of a widower (the always hysterical Steve Carrel) who goes to a family reunion and has a chance encounter with a beautiful woman at a local bookstore. Conversation leads to coffee, coffee leads to losing track of time, losing track of time leads to a rushed goodbye where Dan, who has been leading most of the conversation, finds out this dream woman is in a relationship, but convinces her to give him her number anyway. Once back at the reunion Dan meets his brother's (played by comedian Dane Cook) new girlfriend, and surprise! It's the woman from the bookstore! What follows is a tribute to anyone who knows what an awkward situation a new interest in a person can be, especially if they are in a relationship. Dan In Real Life is just that, real life situations played out so well you feel as if you're there. The film is terribly awkward at moments, painfully so actually. There's something about Dan that makes it feel closer to reality than other awkward comedies like Meet The Parents. Maybe it's because the situations are plausible and not over the top, or maybe it's because the character of Dan is so easily relatable for anybody that has had a crush on somebody at some point in their lives. Whatever the reason Dan In Real Life works on every level and for my money has got to be the funniest movie of the year.